place of silence, contemplation, and full immersion in an individual and collective memory of our region. This is not a nostalgic project. To look at a city from the viewpoint of open spaces means to invert the perspective of a polycentric and functional practice of building, and direct one’s attention toward social relations and the vital flows of a metropolis. 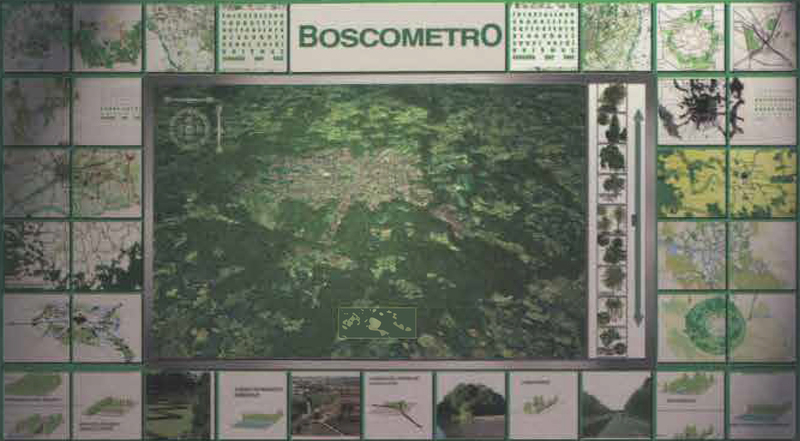 Boscometro is an interactive installation that creates places of discussion and reflection around the project and its deeper meanings. On a screen, viewers see aerial views of Milano, Turin, and other cities. At first, the chosen city looks grey and covered with smog. Viewers choose trees from a side menu and drop them in the Boscometro area. As the trees multiply, the city looks cleaner and brighter. This installation has profound social and ecological value, and it is a joyous way of involving people in a very serious project. visual effect must be scale-dependent so it can produce views that dynamically change according to the zooming level. These features are best fulfilled in a true GIS environment rather than a general-purpose graphic engine coupled with a DBMS. The general drawback of most GIS-based applications is a poorly designed user interface, which makes them appropriate mainly for technical uses. ESRI’s ArcGIS Engine makes available the ArcObjects Library through API support for all major programming environments: C++, Java, .NET, ActiveX on Windows, Linux, and Solaris. It is also embeddable in web applications (the ADF web-development framework and ArcIMS web services). This project is in progress, sponsored by several Italian cities.